Optional Single Supplement: $1139 USD (number of singles limited). One look at the mountains framing the sky or the lakes that mirror any beauty that happens to be above the calm surface and we will come to understand how it feels to be in a utopia. On our Spain & Morocco tour you can explore utopia. The elegant buildings throughout the city seem as intricately placed as the cobblestones that line the streets. Take a simple stroll along alleyways lined with balconies supporting flowerbeds overflowing with colour and we will learn to use the word 'quaint' a little more mindfully. Massive monasteries and cathedrals known to humble any onlooker, not only stand on the northern shores of the Mediterranean, but they are also south of the waters of Morocco. The continuous wonderment will not disappoint, especially when we witness how the majesty of the Roman Empire endures through its many structures left behind. I thoroughly enjoyed the trip to Spain and Morocco. I have travelled with AA many times and there is a consistency to the experience that keeps me coming back. I can count on an experienced tour leader, interesting accommodation, local food, good local guides and 'adventures'. I really enjoyed the Alhambra - the local guide on this tour was particularly good. He was informative and did not rush us through. The Pileta Caves were most interesting as were the Kasbah Taourirt and Volubilis. The sand dunes were stunning. Generally the evening meals were varied, involved interesting local food and for the most part were delicious. The buffet breakfasts in the hotels in Spain were marvelous. The beds in all the hotels were comfortable. In Spain I most enjoyed: the Prado in Madrid, Toledo, the Mezquita-Catedral in Córdoba, the Al Hambra (of course), the Seville cathedral. In Morocco, the Hassan II Mosque in Casablanca, the Fez medina (amazing and astonishing), Volubilis, and all of the south, but especially the Todra and Dadès gorges, Essaouira. All the local guides were, as usual, very good. The evening meals were very good to excellent. There was a variety of offerings, including local specialties, and in some very interesting venues. The hotels were excellent. A wonderful trip. This morning we travel to Toledo, a city with a unique blend of Arab, Jewish, Christian, Roman, and Visigothic elements. Toledo sits on a rocky promontory isolated on three sides by a looping gorge of the Tagus River. The history of several different cultures is contained within this region, represented by the houses, synagogues, churches, and mosques. Our excursion includes a visit to the Cathedral, as well as the Santa Maria la Blanca Synagogue, which shows the influence of the Granada Moors. We also see one of Toledo's most outstanding attractions, El Greco's masterpiece "The Burial of the Count of Orgaz" located inside the Church of Santo Tome. After lunch and some free time in Toledo, we return to Madrid. Today we travel by road to the Spanish port of Tarifa from where we ferry across the Strait of Gibraltar to Africa and the Moroccan city of Tangier. Tangier is a fascinating Moroccan city to visit. It has many of the things that travellers love -- a sense of exotic mystery, interesting history, beautiful vistas, unspoiled beaches, and friendly people. Tangier is an interesting mix of north Africa, Spain, Portugal and France. Upon arrival we'll have a tour of this quickly growing and very colourful city. Today we travel by road to Casablanca with a stop for lunch en route. Casablanca is believed to have been a Phoenician settlement and later a Berber town. It was conquered by the Almohads in 1188, and developed by Sutlan Abd el-Moumen as a port. In the 14th century the Portuguese established a settlement here on the site of the village of Anfa, but when it became a pirates' base in 1468, they destroyed it, repeating this act in 1515. The Portuguese reestablished themselves in the late 16th century, renaming the town Casa Blanca, staying until 1755, when an earthquake destroyed the settlement. This morning we visit the Hassan II Mosque, a glorious structure believed to be only second in size to Islam's most important site, Mecca in Saudi Arabia. The mosque was inaugurated in August 1993, the culmination of five years of intensive labour by over 30,000 workers and craftsmen. Non-Muslims may enter as part of a guided tour. From Casablanca we travel to Rabat, Morocco's third oldest Imperial City and modern capital. Among the sites in Rabat that we will visit are the the Hassan Tower and the Mohammed V Mausoleum. Leaving Rabat we travel to Fes arriving in time for dinner. The historic city of Fes lies in the Oued Sebou basin, astride the traditional trade route from the Sahara to the Mediterranean and the path from Algeria and the Islamic heartland beyond. For centuries the dominant axis within Morocco was of Fes and Marrakech, two cities linked by their immense power and rivalry. Fes is still seen as the spiritual and cultural capital and holds an enduring fascination for visitors with one of the largest historic medinas full of monuments reflecting the different periods of Morocco's imperial past. This morning we visit the impressive site of Volubilis, the best-preserved Roman site in Morocco. Situated on the ledge of a long plateau, the dramatic site was once one of the Roman Empire's most remote outposts. Our local guide here will take you on tour of the site; we also allow free time for photographs. We also see the sacred town of Moulay Idriss (photo stop only). Moulay Idriss is a dramatic sight, houses and mosques piled up around two rock outcrops, with the 'zaouia,' or sanctuary, in between. We continue to Meknes, Morocco's youngest Imperial City. We feature the Bab El Mansour gate dating from 1752, complete with its Corinthian columns. The city was built by a massive army of slaves, both Moroccan and Christian, and the Sultan was in particular famed for his barbaric treatment of these people, supposedly interring them in the walls. The city contained within it all that was necessary for such a large population and military machine, with store houses, stables, armouries, exercise areas, gardens and ponds. 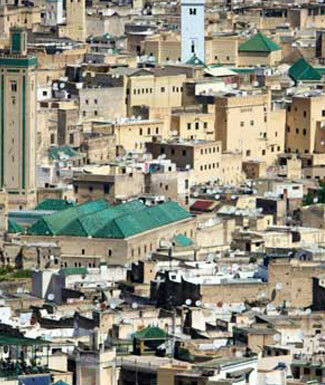 Today we will have a walking tour of Fes El Bali, the extraordinary medieval walled city. Once inside the gates of this great spectacle, you will see an entirely different view of life in Morocco. In contrast to the well-planned Ville Nouvelle, the old city is a labyrinth of alleys and lanes lined with shops, mosques, homes and schools. In 1980 UNESCO designated the medina a World Heritage Site. Our guide will take us to the medina to view the market shops, or suqs. Everything from food to clothing can be purchased. We will see the famous dying works with the brightly coloured cloth hanging to dry. A visit to the Royal Palace, several mosques, theological schools, and shops where we can see craftsmen tailoring their work will round out the day's tour. Today's walk is an amazing look into the life of the Moroccan city dweller where little has changed over the centuries. We have a morning departure for the Middle Atlas, a region of folded mountains and high, windswept plateaux, vast forests of cork oak and cedar, and lakes and streams full of trout. This is Berber country and sheep and goat-rearing is the main occupation of these resilient, friendly people. We drive via the Berber villages of Imouzzer du Kandar; Ifrane, a fairy-tale town unlike any other in Morocco with white-walled French-style villas with steep red roofs and gables. As the altitude increases, we come to a bare, arid, sandy plateau with another range of mountains in the distance. We continue to Erfoud, an attractive town -- red and sandy, exuding desert ambiance. This morning we journey to the historic 8th century caravan town of Rissani to visit the Tafilalt Oasis. The first capital of the Tafilalt and the last stop on the caravan routes south, Rissani has a special place in Moroccan lore. The ruling Alaouite dynasty (from whom Morocco's current ruler, Mohammed VI, is a descendant) launched its bid for power here before triumphing finally in Fes and Marrakech. Today, a quarter of Rissani's population still inhabits a large 17th-century ksar in the center of town. Later this afternoon we drive by 4WD vehicle to Merzouga to witness sunset over the dunes. We have time to explore the dunes on foot, or by camel! This is a magical landscape, with huge drifting expanses of sand dunes reaching heights of more than 45 metres (148 ft). Their colour shifts from pink to gold to red to white depending on the time of day. This morning we depart for the Todra Gorge, one of Morocco's most spectacular sights. It is a vast fault in the plateau separating the High Atlas from the Jbel Sarhro, two sheer cliffs over 300 metres (958 ft) high separated by a narrow corridor only 20 metres (66 ft) wide. Later we cross the southern slopes of the High Atlas before arriving at the captivating city of Ouarzazate. We stop en route in the heart of the Dades Valley at the oasis of Kelaa Mgouna. Our first visit this morning is the Kasbah Taourirt, once belonging to the famous El Glaoui governors. We then proceed to the kasbah of Ait Benhaddou, one of the most spectacular sites in Morocco. The site, which has received extensive renovations from UNESCO, towers high above the El Mellah River and has some of the most highly decorated dark red pise walls. We arrive in the new village on the west bank of the river and proceed to cross the river, usually with an entourage of local children. After a brief tour and time for independent exploration, we continue our journey toward Taroudannt through the Souss Valley. The area is rich in agriculture, producing oranges, bananas, tomatoes and other crops. As the capital of the Souss Valley, Taroudannt has traditionally been an important staging post in the Trans-Sahara caravan routes. The old city is surrounded by nearly 5 km (3 miles) of rich red-ochre walls. The walls, considered by many to be the best preserved in Morocco, give the town an elegant feeling. This morning we have a caleche (horse-drawn carriage) ride around the walls of the city before beginning our walking tour of the suq area. The town is famous for its two suqs: the Souk Arabe and the Marche Berbere. The former specialises in handicrafts and jewelry; the later is famous for house-wares, spices, wooden objects and furniture. This afternoon is free for you to explore on your own. You may wish to spend more time in the bazaar or take a walk around the impressive city walls and bastions. This morning we travel toward the Atlantic coast and make a short stop in Agadir. From here we travel northward to the fortified, whitewashed fishing village of Essaouira. Once a pirate community, the town is located on a rock promontory overlooking the sometimes raging Atlantic Ocean. There was a small Phonenician settlement at Essaouira, previously called Magdoura or Mogador, a corruption of the Berber word 'Amegdul,' meaning ‘well-protected'. The Romans were interested in the purple dye produced from shellfish which they used to colour the robes of the rich. Orson Welles stayed here for some time, filming part of Othello at the Skala. In the 1960s Essaouira had a brief reputation as a 'happening place', which attracted hippies, notably the rock star, Jimi Hendrix. Before dinner you may want to stroll along the extensive beach or visit the colourful fish market. Essaouira is one of Morocco's most charming towns. Old Mogador was occupied in the 15th century by the Portuguese who built the fortifications around the harbour. These impressive ramparts still give the city a fortified look. Today you will be guided on a leisurely walking tour of this coastal city. The port area offers an interesting look into the fishery industry of Morocco, and the jewellery suq offers some of the best silver items available. You may also wish to visit one of the many art galleries or visit the Musee Sidi Mohammed Ben Abdallah which features excellent displays of marquetry and handicrafts. Be sure to visit the Marchee d'espices (spice market) where you can purchase your cooking spices or pick up some "cures" for whatever ails you. Today we travel from Essaouira inland to Marrakech. As we approach Marrakech, the scenery becomes flatter and greener, as the city is the centre of a large palmerie oasis. You will notice an abundance of the pink mud-brick buildings amid this tree-filled city. 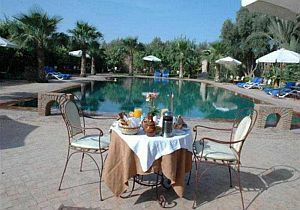 With it's unique character and charm, Marrakech lures visitors with a hospitable climate and superb location. This evening we visit the famous Djemma el-Fna in the centre of the city. The Djemma el-Fna is like nowhere else in North Africa. This "Assembly of the Dead," offers a spectacle that is a must-see when visiting Morocco. In the busy square you will witness a carnival of musicians, snake charmers, acrobats, story-tellers, witch doctors, dentists, clowns, monkey's and the like. The enduring smells of the Djemma's food stalls, piled high with platters of specialty cuisine, are well worth a visit just for the experience..
Marrakech is one of the world's most enchanting cities. The city is situated on a lush palmerie and city dates to the Almoravid Dynasty circa 1670. Founded by Youssef bin Tachfine, the city became the dominant centre of Morocco. Our morning walking tour takes us to the Koutoubia, nearly 70 m (230 feet) high and emulating the classic Moroccan design. We will also take a short walk through the Mellah or Jewish quarter. This afternoon we allow free time to visit one of the many gardens -- the Majorelle Garden is recommended. Within the gardens is an excellent museum displaying a collection of Berber objects originating from diverse regions of Morocco, from the Rif to the Sahara. Located in the center of Casablanca just a short walk from the Casa Port train station at the heart of ...	business district, this 281-room 4-star Novotel offers an unrivalled view of the Hassan II Mosque and the port of Casablanca. Our banquet team knows how to create the ideal setting in one of the 5 meeting rooms, equipped with the latest technology and able to accommodate up to 220 people. The Mohammed V Airport lies 19 miles (30 km) and 30 minutes away from the hotel. Riad El Yacout is an old traditional formally residential home that has been carefully restored to provide hospitable, comfortable and ...	luxury accommodation. This house was built by a famous researcher & professor at university of Quaraouiyine in the 16th century. 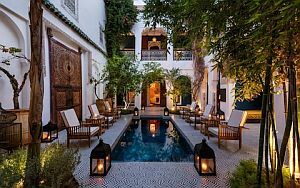 In the year 2000, the current owners bought this property and spent years to restore the riad . This chic resort along N13 is 65 km from Errachidia Airport. It's 2 km from Musée Tafilalet Dar Zaouia, a ...	art museum. The hotel different kinds of spacious guest rooms fitted with single, twin and queen-size beds, comfortable berber tents, terrasse, small ...	nice swimming pool. Tucked away amongt the trees and the 14 air conditioned Bungalows and 8 Suites, a new accommodation of 8 Luxury ...	rooms (equipped with shower , private terrace ,air-conditioning, TV & satellite, wireless). Dar Zitoune is ideal for anyone seeking peace and quiet. 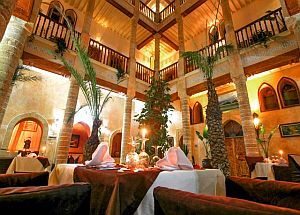 Set in a converted 18th-century townhouse within the medieval medina walls, this upscale hotel is a 1-minute walk from the ...	exhibits at Musée Sidi Mohamed Ben Abdallah and a 7-minute walk from Essaouira Beach and the Atlantic Ocean. Set in 6 restored riads with interior courtyards, this warm, upscale hotel is a 9-minute walk from Jemaa el-Fnaa, a ...	old town square. Breakfast and dinner (hotels & local restaurants) daily. All sightseeing, transport and entrance fees for sites noted as 'visited' in the detailed itinerary. Gratuities for local guides, drivers, restaurant staff, porters. Airport transfers for land & air customers arriving / departing on tour dates. This tour is offered in spring and fall when temperatures are mild. Showers are possible in spring and possible in late fall and winter. For a couple of years, starting from 2020, our spring dates are a little later in the season in order to avoid widespread closures or reduced hours for important sites during the holy month of Ramadan in Morocco. For these times, late May/early June, we will likely experience some heat in certain locations. Land transport throughout by private air-conditioned motor coach, 24-36 seats depending on ultimate group size (see 'group size'). Though we will have some full bus days (especially in Morocco) there are plenty of stops of interest. Roads are in good condition though winding on some stretches. Spanish train journeys are comfortable (2nd class). YOU MUST BE ABLE TO MANAGE YOUR OWN BAGS ON/OFF TRAINS AND IN TRAIN STATIONS. This trip involves considerable walking up hills and stairs and on uneven or cobblestone streets. You should be in good physical condition to enjoy the tour to its fullest. Please also note that, due to the narrow and winding nature of the streets and the size of our vehicle, we may need to park some distance away from our hotels in Granada, Córdoba, and Rhonda and walk our luggage a short distance. Well-located, air- conditioned, mid-range hotels (3-4 star) throughout. All hotels have en suite bath, though some may have shower only. Porter service is usually available is Morocco (see 'inclusions'), not so likely in Iberia-you should be independent with your luggage. Single rooms are limited and likely smaller than twins.